More than 380 species of anole lizard have been cataloged. All of these lizards originate from the Caribbean islands except the green anole, which is the only species native to the United States. Although hundreds of anole species have been identified, only seven are commonly found in the herpetological pet trade. Anoles are small lizards that primarily eat insects. They have pointed snouts and thin limbs. 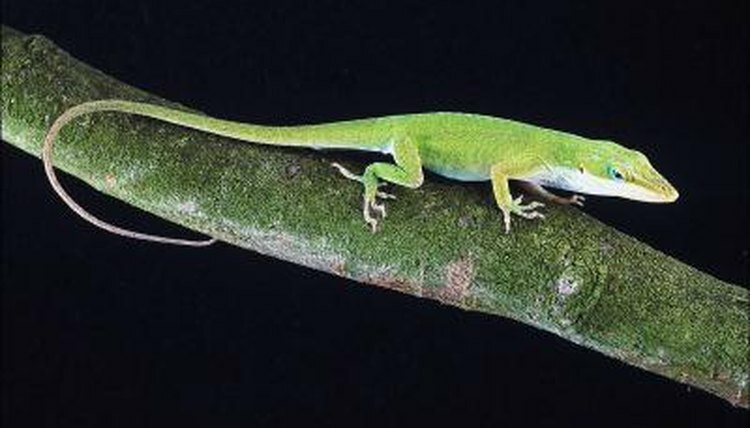 Most anoles are arboreal, spending the majority of their time on tree trunks or in the canopies. Terrestrial species are called grass anoles. They live in tropic or subtropic climes. Anoles are generally a shade of brown or green. Many anoles have the ability to alter their skin color. Male anoles have distensible throat fans that they can display as part of mating rituals. Each anole species has distinct throat fan colors and markings. Anolis carolinensis, or the common green anole, originates from the southeastern United States. It reaches about 9 inches in length. The green anole's range extends up to North Carolina, as far west as Texas, and south through Florida. Although Florida is its natural habitat, the green anole has largely been replaced by other anole species in this area. Anolis carolinensis has also been introduced to Hawaii, the Ogasawara Islands of Japan, Cuba, the Bahamas and Guam. Anolis equestris is referred to as the Cuban or knight anole. This species is the largest of all the anoles, with a length of up to 20 inches. Anolis equestris is native to Cuba, but has also taken up residence in Florida. The knight anole is a bright green lizard with a yellow or white stripe under the eye that continues over the shoulder. They can change their skin to a dull grayish brown color via metachrosis. The Jamaican or giant anole is native to Jamaica, but has also established itself in the Cayman Islands and Florida. They grow to 11 inches long and are most notable for the crest of small, sharp ridges that runs down the length of their spines. Normally they're bright green with light-colored spots or stripes on their sides, but can change to a dark brown or black to match their surroundings. The brown anole grows to 9 inches long. They're native to Cuba, the Bahamas, and other nearby islands, but are also established in southern Florida. Six distinct subspecies of Anolis sagrei have been identified, the most populous of which is Anolis sagrei sagrei, found in Cuba. The bigheaded anole is found natively on the island of Hispaniola, which is divided into the countries Haiti and the Dominican Republic. A. cybotes has also been introduced to Florida. They are brown in color and grow to 8 inches long. They're distinguished by the crest of skin on the back of the neck that they can raise like a sail. The bark anole is one of the smallest species kept as a pet, reaching only 5 inches long. They're named after their brown, mottled skin that helps them blend in with their natural habitat on tree trunks. They're found native in the Caribbean islands and have established a population in Florida. The Puerto Rican crested anole grows to 7 inches long. They're native to their namesake island as well as Anegada, Tortola, Virgin Gorda, Jost Van Dyke, St. John and St. Thomas. They're considered an introduced species in Florida, the Dominican Republic and Costa Rica. Anolis cristatellus may be various shades of brown with patterns on the skin. Both males and females have a crest on the back of the neck and males may also have crests on their tails.